Check out our research guides on the new 2019 Inductees, as well as those nominated for the 2019 class! Please note the Library & Archives will be free and open without an appointment for visitors to view the exhibit 9AM - 5PM every Friday through June. If you wish to visit a different day of the week, please contact us to make an appointment at library@rockhall.org. 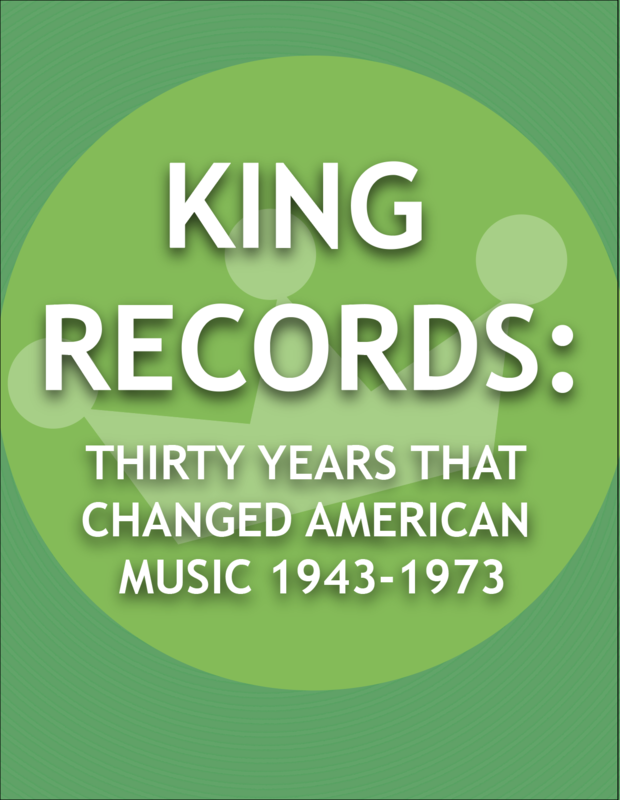 From 1943 to 1971, Cincinnati's King Records and its subsidiaries, including Queen, DeLuxe, and Federal, revolutionized the ways in which popular music was recorded, manufactured, distributed, and promoted. Under the leadership of founder Syd Nathan, King became a major independent record label, with nearly 500 singles on the R&B, country, and pop charts, and 32 songs making it to Number One. This traveling exhibit on the history of King Records was developed to tell the unique story of this influential company beyond its home of Cincinnati. Following a symposium and exhibit at the Public Library of Cincinnati in 2008 to mark King Records’ 65th anniversary, King Studios, a nonprofit organization was formed at the original King Records headquarters. With funding from ArtsWave, King Studios board member Tim Riordan, the Community Building Institute, historian Brian Powers and designer Chris Schadler collaborated to visually present 30 years of legendary music created by King Records. Our Library & Archives staff has curated a Spotify playlist showcasing some of our favorite music released by King Records during its 30-year history. The playlist can be accessed at http://bit.ly/RHKingRecords. Highlights from a newly acquired photography collection are on exhibit in Something Going On: Jeff Rusnak, A Rock & Roll Life at the Rock & Roll Hall of Fame. Starting in the 1970s, Jeff Rusnak (1956-2016) was a fixture in the pits of rock clubs and concert halls in New Jersey, Philadelphia and New York City – snapping hundreds of thousands of images, a fraction of which are now on display in the Rock Hall’s new photography gallery. Rusnak had a deep love of music that was evident in every part of his life. He was a late-night disc jockey, musician, producer and manager at the legendary Princeton Record Exchange, and an incessant photographer. Many of the photos he took were of bands as they were just getting started, such as Black Flag, U2, the Clash, and Ween. Rusnak himself was an intensely private person. Much of his collection was discovered after his passing and generously given to the Rock & Roll Hall of Fame to enhance the museum’s mission to engage, teach and inspire through the power of rock and roll. His photographs permanently reside in the Rock Hall’s Library & Archives. On display are images of some of the most iconic figures in rock in the past forty years, showcasing national, international and local Philadelphia acts, including David Bowie, Henry Rollins, Joe Strummer, Elvis Costello, Frank Zappa, Stevie Nicks, Nancy Wilson, Tina Weymouth, Annie Golden, Wayne Coyne, Jello Biafra, Peter Gabriel, the Who, Talking Heads, Adam Ant, Devo, Ramones, the B-52’s, Frank Zappa, Flaming Lips, Yes, Gary Numan, Chuck Berry, and more. Original and digital prints on display are just a few examples of the thousands of photographs in the Rusnak collection, now housed at the Library & Archives, located on the Metro campus of Cuyahoga Community College at 2809 Woodland Avenue in Cleveland. To view the collection, please make an appointment by contacting library@rockhall.org.